The Frana pen holder was designed by Christophe Guberan for Alessi. It is an exceptional pen box since it either presents its content or hides it depending on its position. 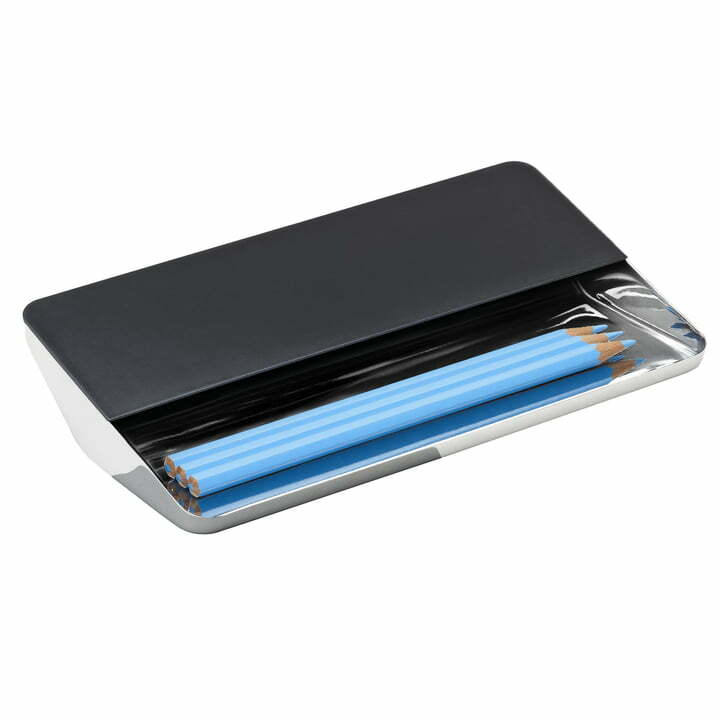 It was the aim of the designer to offer the possibility of presenting a clean working surface and to ensure an easy access to the hidden content of the pen box without the need of opening the cover. Instead, the Frana pen holder is simply tilted to the other side along its longitudinal axis, and the hidden writing tools will slide into view. Frama is made out of polished stainless steel, partly coated with black, thermoplastic material. The function of the swinging pen holder by Alessi is ensured by a counterweight in the base, which stabilises the position of the swinging object.